Save-A-Lot is one of the nation’s leading extreme value, carefully selected assortment grocery chains, operating nearly 1,200 value-oriented stores in all types of neighborhoods. When they came to matrixx the task was simple, obtain more than _ coupon downloads. 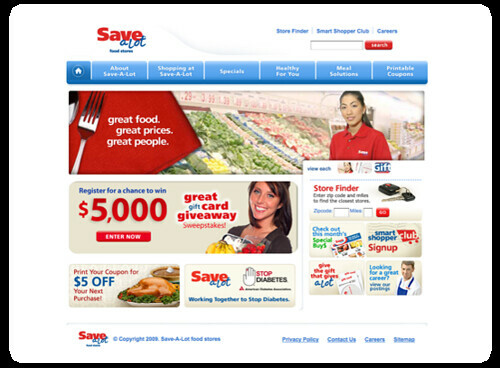 As Senior Interactive Producer for matrixx, I noticed that Save-A-Lot was already running the “Great Gift Card Giveaway” sweepstakes where you could win $5,000 in gift cards of your choice and also their Instant Win Game where you could win 1 of 200 gift cards valued at $25. I instantly realized the missed opportunity and requested we allocate a portion of the campaign budget to give the user the ability to print the “$5 off Coupon” after completing the sweepstakes and instant win. I also worked with Kelly McCallion, Erin Brown and Al Morales to craft an inviting blogger outreach campaign. After personally contacting our favorite budget conscious bloggers we sent out Save-A-Lot gift cards for them to review the no-frills store and perhaps give-away some of the cards to their readers. I was also responsible for managing the campaign’s Google Adwords and Facebook Ads. Additionally, we created a company branded Twitter page and utilized Save-A-Lot‘s pre-existing Facebook page to grow it’s fan-base and generate more coupon prints. The entire campaign was a huge success generating millions of additional Save-A-Lot website visits and thousands of additional coupon prints.